Glassware collectors of Depression Era Glass are encouraged to submit glass pattern requests. Take a look at our Glass Gallery to see some samples of the glassware we feature. We also participate in Glass Shows throughout the country. While we specialize in Fostoria and Cambridge Glassware, we also carry rock cut and many other glass manufacturers like Tiffin, Westmoreland, Heisey, Duncan & Miller, Imperial, Morgantown, Libbey Rock Sharpe, Paden City, and New Martinsville. 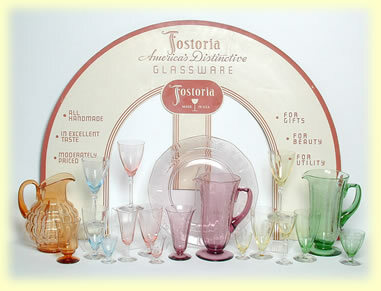 We also feature a large selection of depression era glassware patterns.